Verification products include both DRC and LVS. The LVS product includes a compare module to compare the extracted netlist to the reference netlist. Both products are integrated within the slam environment. Both are invoked from within slam. The results of the DRC product are stored in the database and may be reviewed with VioVue which is part of the slam layout viewer. The LVS product generates a text error report in addition to the graphical error report. The LVS product can also generate a netlist from the layout in spice format. New in 3.9.1 is multithreading the DRC/LVS. Commands are spawned to a thread as the components for the command are available and the maximum number of threads running has not been reached. A fairly typical deck can have 8 threads running simultaneously without rewriting the deck to optimize for threading. Note that memory usage grows with more concurrency. The DRC/LVS forms were modified to allow user control of the maximum number of threads. New in 3.9.0 is the ability to extract parasitic wiring resistance from the layout. A full RC model of the interconnect wiring can be extracted and converted to spice. Additionally, graphical display of the wiring resistance is available and can be cross probed with the spice text file. Also in 3.9.0 is a new option to the MOSFET device extractor to allow for source/drain identification for devices that do not have a symmetrical source/drain. New in 3.8.2 is a new example and some changes to the existing examples. Also in 3.8.2 is the Archive Assitant which requires the LVS key to search the archive for matching netlists. The assistant searches in 3 easy steps. 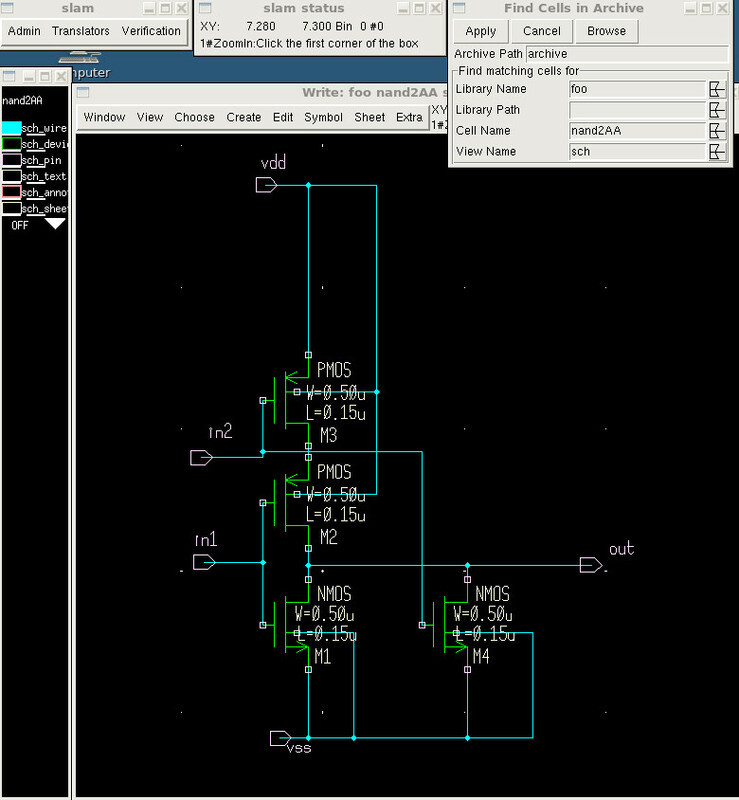 First either a schematic or netlist is selected. 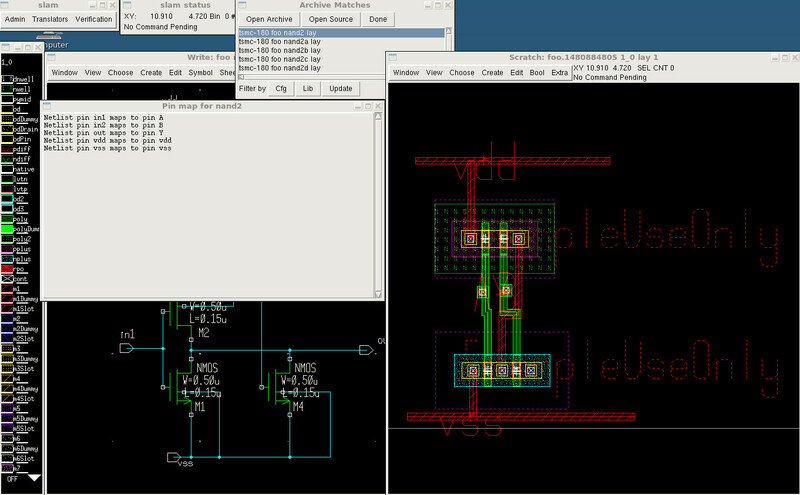 In this case a simple nand2 schematic will be found in the archive named "archive" in the current directory. After "Apply" has been clicked on the search form, the archive is searched and the results are displayed. After selecting one of the matches and clicking on "Open Archive" to open the archived copy of the layout, the layout will be opened in the editor as displayed here. New in 3.6.1 are several new DRC commands to check edges of shapes instead of the whole shape. With these latest enhancements, you can check most 0.18 micron processes. New in 3.5.5 is antenna checking. Top of metal, side wall and cut ratio checks are supported. Top, side wall and cut can be summed for a single ratio check, or checked separately. The new antenna commands can also create the LEF antenna model data to complete that part of the abstract model. A few new checks such as selecting holes of a polygon was also added in 3.5.5. Note the 3.5.4 release offers a completely new any angle more efficient LVS. The old code can still be called. As with DRC, the new LVS offers some options the old LVS did not support such as extracting NRS/NRD, WPE and STI for MOS devices, but the new code is backwards compatible and can run prior decks unchanged. The new 3.5.4 code offers some command options not available in prior releases, but the new code is backwards compatible and can run prior decks unchanged. Note the new any angle code does not currently support area mode, only whole cells can be verified. * Width, one and two layer spacing checks, enclosure checks and boolean operations. * End of line checks for asymetrical via enclosure rules. * Enclosure check can verify poly extension of active and active extension over poly. * Layer density check. (Min and max). * Polygon selection based on width, area or holes. * Polygon selection based on compare poly crossing, abutting, inside, outside, etc. * Selection of polygon hole. * Polygon selection based on interaction count. * Edges of polygon selection based on edge overlap with a compare polygon. * Further subselection of polygon edges based on edge length. * Metal check deck can be auto-generated from configuration file. useful to quickly generate check decks for P&R edit checking. * Antenna check (either area of shape or edge of shape, accumulative by layer or spacified layer). * LEF antenna model generation. * MOSIS DRC deck included. * LVS includes a interconnect capacitance extractor mode. * LVS instance extraction mode to extract interconnection information between blocks or standard cells. * Generic 4, 5 and 6 layer metal process LVS decks included.